Facebook has announced a raft of new features to its Photo service, upgrading the picture quality of images and making it easier to share photos. 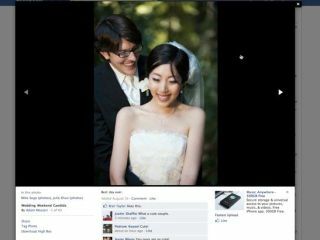 Browsing and tagging have also been improved, with Facebook introducing "a better photo viewer". The new viewer simplifies navigation of photos, and the frame around the images has been darkened to highlight the picture more. It also means that you don't have to go onto a new page to view photos, as the image opens in the centre of the screen. Bulk tagging has been added, so you can tag multiple photos of the same person / event a lot easier. The biggest improvement, however, is in picture quality. Images will now be shown as 720 pixels to 2048 pixels, which is a whopping eight times bigger than what the site delivers at the moment. You can download images easier too, by simply clicking on the Download link option. Sam Odio from Facebook says about the release: "When we originally got started on Photos, we only had two people working on it. "We didn't build out a lot of features; we just focused on making sure photos were easy to share and this made Photos a great social experience. But we also wanted to give people on Facebook the best quality photo product on the web… So I'm excited to announce three big improvements to Photos." The new and improved Facebook Photo will be available to the public sometime this month. If you want to see the service in action, though, then head over the National Geographic Facebook page.